Hanging out in Seoul Namdaemun Market of South Korea, you will come across many surprises. In the preceding articles, I had blogged on coffee cart vendor and street lady preacher. As in the above photo, this is another interesting episode in Namdaemun Market. The scenario is outside Samick Fashion Town. 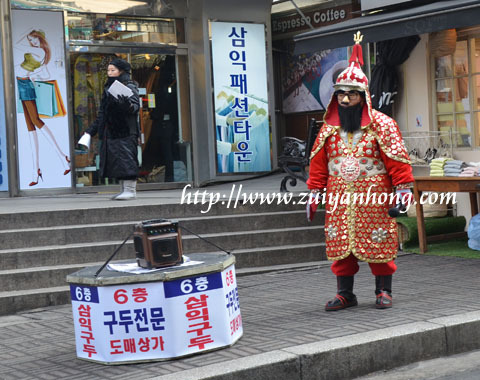 This Korean man with ancient armor is a sales promoter. His duty is to inform passers about shopping outlets at sixth floor (6 층) of Samick Fashion Town. The Hangul on the wooden box indicates that there are shoes wholesale outlets at sixth floor of Samick Fashion Town. Experiencing South Korean lifestyle in Namdaemun Market is truly distinct.